There are many reasons to send professional newsletters. They establish your expertise, help you stay top of mind with your audience and strengthen your community relationships. If you’re creating newsletters for any audience, this guide will get you started on the right foot. ➡ Email Newsletters, Direct Mail Newsletters or Email Attachments? ➡ Blog or Newsletter? Which Should I Do? ➡ How Do I Make a Monthly Newsletter? ➡ How Do You Create a Successful Newsletter? ➡ How Often Should I Send Newsletters? ➡ How Do You Write a Good Newsletter? ➡ What Is the Best Program to Create a Newsletter? ➡ How Do I Create a Newsletter Template? ➡ What Software Do I Need to Send Newsletters? ➡ How Do I Get My Contacts Into My Newsletter Software? ➡ How Much Does It Cost to Send Newsletters? Email Newsletters, Direct Mail Newsletters or Email Attachment? You’ve decided to send a regular newsletter about your business or organization. Good call! But before you get started, you need to choose your tool for creating and sending your newsletter. You want something that’s easy to use. But you also want a tool that will create newsletters that reach your audience reliably and affordably for you, right? #1. You avoid paying printing and shipping costs each time you want to send a newsletter or bulletin. First, PDFs are difficult to read on mobile devices. Nowadays, you can assume the majority of people are reading email on their smartphones. In fact, mobile email usage has been increasing every year for both work and personal emails. HTML emails adapt to match the device they’re on. So you won’t have your subscribers endlessly scrolling and zooming in their attempt to read your newsletter. Second, not all your contacts have the time to click a link or download a PDF. 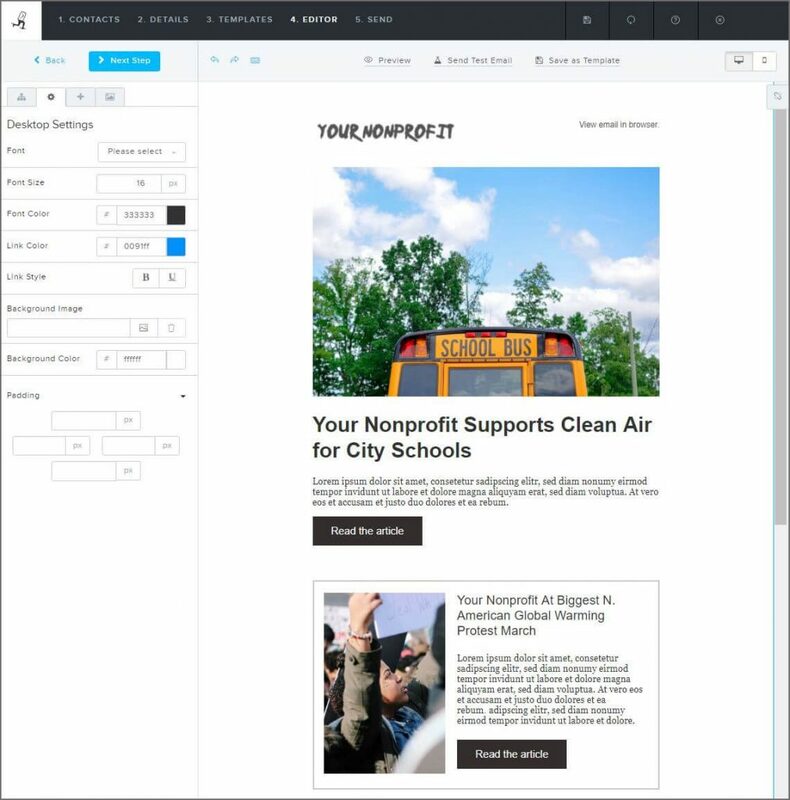 With Newsletter2Go, you create your own newsletter in our HTML campaign editor, so your recipient sees the newsletter as soon as they open your email. There’s no additional decision they need to make to click on the newsletter. It’s already loaded into their inbox. #3. Your email newsletter sails past spam checks. Sending your newsletter as a PDF can be risky. Inbox providers, such as Gmail and Outlook, often automatically categorize mass mailings with attachments as spam. So instead of sending an attached PDF, use an HTML drag-and-drop editor. With our 99% delivery rate and whitelisting, you can rest assured that your email newsletter will arrive in your subscribers’ inboxes. #4. You can personalize each mailing to include content tailored to each recipient. If you create a printout or a PDF, you have, at the end of the day, one document to distribute to the masses. In contrast, an email newsletter can include smart content. Sending many different and individualized emails will make each subscriber feel addressed. #5. Newsletter tools offer granular reporting. Who opened your newsletter? Who interacted with it? Who clicked on what? We even give you a click map showing which links got the most attention. We can tell you all that, but direct mail can’t give you that kind of stats. What’s more, you don’t need programming knowledge to use newsletter software. Drag-and-drop editors make things simple and intuitive. Ready to Try Newsletter2Go’s Intuitive Newsletter Software? Sign Up and Start Creating HTML Newsletters Today! Download the 10 steps as a checklist! Before you start sending your subscribers content, decide what benefits your newsletters promise to deliver. 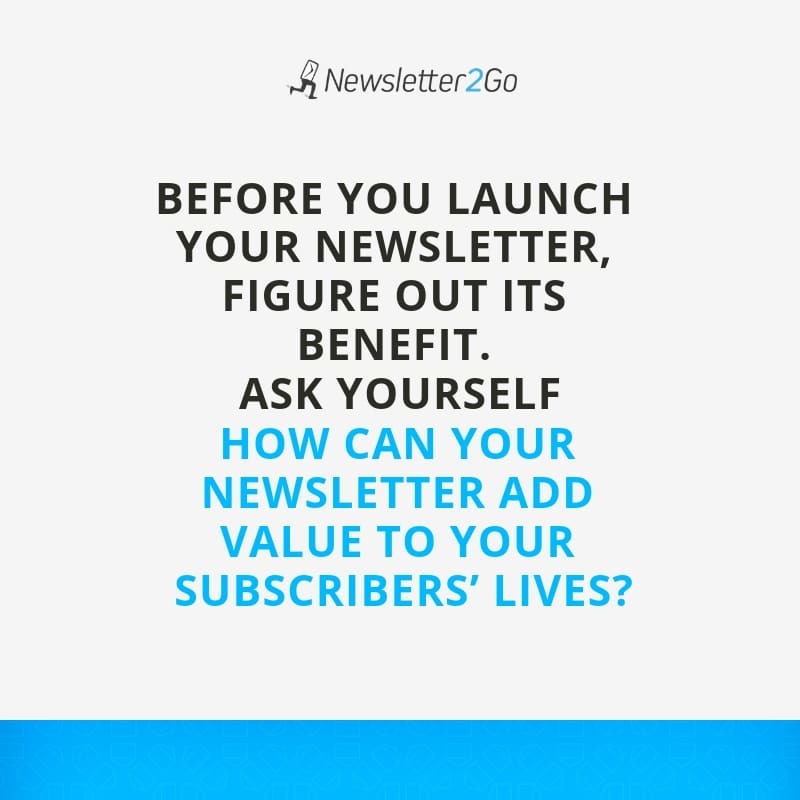 But, whether you’re a nonprofit, an agency, an influencer or a corporate communications guru working on an internal company newsletter, you have to give your subscribers added value in order to attract them and keep them as readers. How can your organization add value to your subscribers’ lives? Can you give them a sense of belonging to something greater through stories? Exclusive access to new products or information? Discounts on upcoming courses? Concrete insights they can apply in their workday? As a rule of thumb, if you craft newsletters that don’t offer content your readers feel brings value to them, they’ll unsubscribe. Even with a “captive” audience, such as an employee newsletter, you still want them to look forward to your emails, not delete them! Knowing the purpose of your newsletter and the benefits of membership to your email list will get you started on the right foot. Humans are creatures of habit. We like things familiar to us. This is a win-win for both you as a marketer and your audience. For you as a marketer, it means that every time you send your newsletter, you don’t have to start from scratch. Decide what type of information you want to share in your newsletter and how much of it. A call-to-action (CTA) is a link or button that calls the reader to action, urges them to click. Every newsletter you send should include at least one prominent CTA. Read more about best practices for email CTAs. Your audience will benefit from the familiarity of your newsletter. They know what to expect from you every month, and if your content adds value for them, they’ll look forward to it. There’s one very important final piece to note here. Plan a newsletter formula that you have the organizational capacity to repeat. You can always fine-tune it, but you don’t want to bite off more than you can chew. For example, if you have a tiny, or even part-time, marketing team, make sure they’ll be able to replicate this newsletter every month with the time they have allotted for it. In our software, all it takes is a single click to turn any email you’ve made into a template you can use again later. Now that you’ve chosen your content formula, it’s time to consider how it will look when you put it all together. This is where you start thinking about overall layout and the visual components. Ask yourself: What do you visually want to communicate with your newsletter? What kind of layout will be most appealing to your community of subscribers? Not sure which newsletter format will work best for your audience? Pit your top two favorites against each other and see which one wins! A/B testing in email marketing is a great way to figure out exactly what appeals to your audience. For example, will every story have an accompanying image like the template below? Or will you instead choose one strong header image and follow this with short engaging texts? Check out our free newsletter templates. In your account, you can use these templates or see them as inspiration for your own template planning. Finally, when creating the overall look of your newsletter, there are two elements that you need to consider specifically with online newsletters. Make sure you balance text and image when creating HTML newsletters. In general, this is a good design rule, not just for email. It’s easier on the eye when large chunks of text are broken up by spacing and images. Simultaneously, images should be complemented by explanatory copy where needed. Whatever you do, don’t just insert a bunch of images (or screenshots of image and text) into your newsletter! 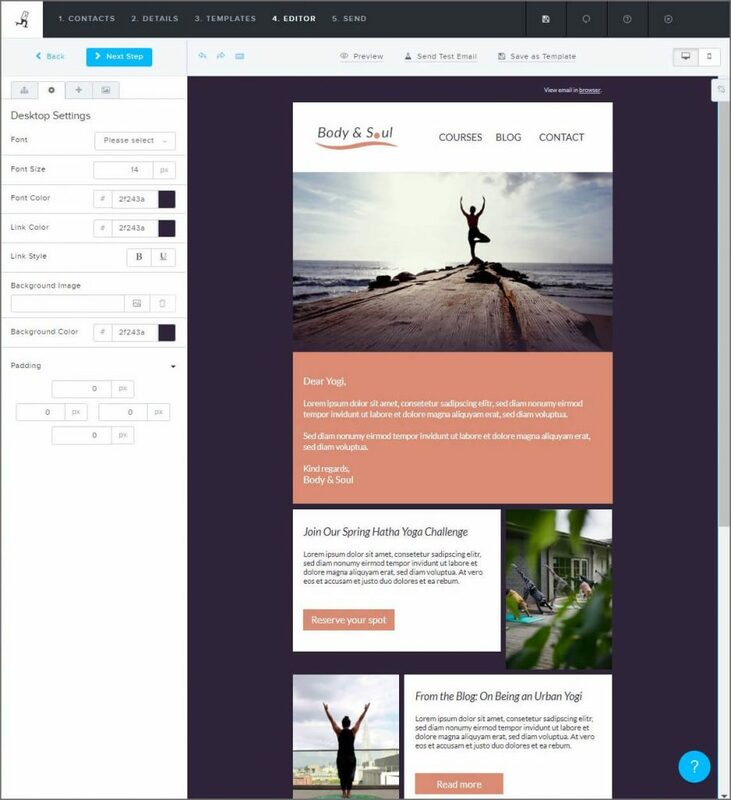 Use a responsive email template. As a recent study on email habits shows, 43% of American consumers check their work email primarily on their smartphone. The percentage increases for personal email. Because of this, your email newsletter needs to be able to adjust format according to the device it’s displayed on. Software to create email newsletters should always offer you templates with responsive design. This means the email looks as good on a mobile device as it looks on the desktop. Buttons should be easily clickable. Subscribers shouldn’t have to scroll right, struggle to read images or fiddle with the zoom feature when checking email on their mobile devices. Don’t forget that your email newsletter should match your branding! Corporate design is as important for your email as it is for your business cards. Consider design elements such as logo, slogan and corporate color palette. Consistent branding works to make your repeatable format instantly recognizable to your audience. Ensuring you have this consistency will add to your readers’ feeling of familiarity. In comparison, inconsistent design causes confusion in subscribers. If they don’t immediately recognize that an email is from you, they might delete it. Although people check email often, they do so in a “scan” mode. Which is the opposite of thorough! Our editor tool gives you precise control over your mailing. You can adjust padding, margins and colors to your heart’s delight! Which Newsletter2Go Plan Is Right for You? You’ve planned your newsletter format, you know what branding you want to use, but now you have to actually put content into those categories you decided on. Where are you going to source that content from? Use the third option sparingly! Newsletter marketing is not like social media marketing, where you’re expected to share other people’s posts more than your own posts. You can include content from others, but you should do so at a ratio of no less than 3:1. For every link to content not your own, you should have at least 3 links to your own page. Some newspapers include external content in their newsletters as a category called “What We’re Reading Now.” This is a nice way to link to content not your own. Also, once your newsletter is well-received, you can offer “sponsored post” slots in your newsletter as a way of earning advertising revenue. 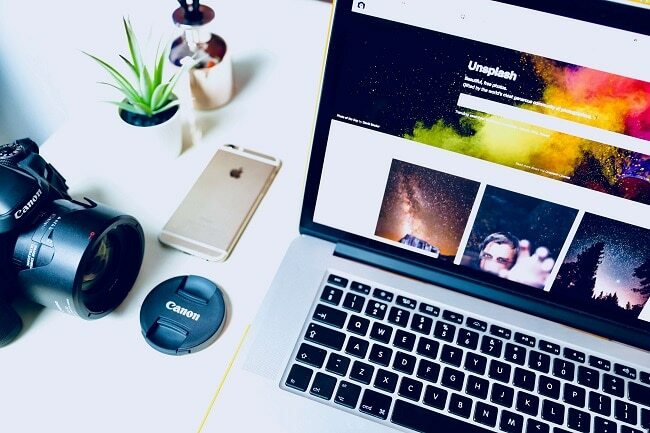 Just like you have to choose your content, you also need to decide which images you’ll be inserting into your newsletter. It’s best to use your own professional images for consistent branding. But if you don’t have that, don’t panic. There are many free stock photo services available that let you use their images commercially without paying royalty fees. And a ton of these stock photo services are hip enough that they don’t even look like your typical stock photos. If your options are stock photos or amateur snapshots and candids, always choose stock for your newsletters. It will make them look more professional. Our newsletter software has an integration with Unsplash. This gives you access to an online gallery of royalty-free, high-quality photographs. You can browse, insert and edit their images directly from our editor tool. Depending on where you live, there may be legal restrictions on who you’re allowed to send newsletters to. In general, we always recommend permission marketing, as it guarantees more engaged (and fewer annoyed) subscribers. Permission marketing means subscribers sign up to your newsletter themselves and then go through a double opt-in process in which they confirm their email address. Within the European Union, proof of a subscriber’s consent to receive your mass mailings is a legal requirement of the GDPR, a data privacy act in force since 2018. In addition, your newsletter should include company address and an unsubscribe link in every mailing you send. Traditionally, the footer is the place to include this. Company address and an unsubscribe link are legal necessities both in the USA and in the EU. Not only are all the processes in our software GDPR-compliant, but our servers are also in Germany. You can rest assured that your contacts’ details are safe with us. There are three things that affect if recipients will open emails from you or not. 💭 The first is your reputation with your subscribers. If they like getting emails from you, they’ll open your missive whether your subject line is a bunch of typo-ridden nonsense or the snazziest copy since David Ogilvy reigned. But few organizations have such dedicated fans. These should grab your subscribers’ attention right from the get-go. There’s only one way to get good at subject lines: Practice them over and over. Run them through online subject line evaluators. Brainstorm 25 different possible subject lines and post them as a poll on your company Slack channel. See which one people like the best and use that. Show them to your friends, your mom and, above all, your team. Whatever you do, don’t fall into the newsletter title trap! Noooooo. 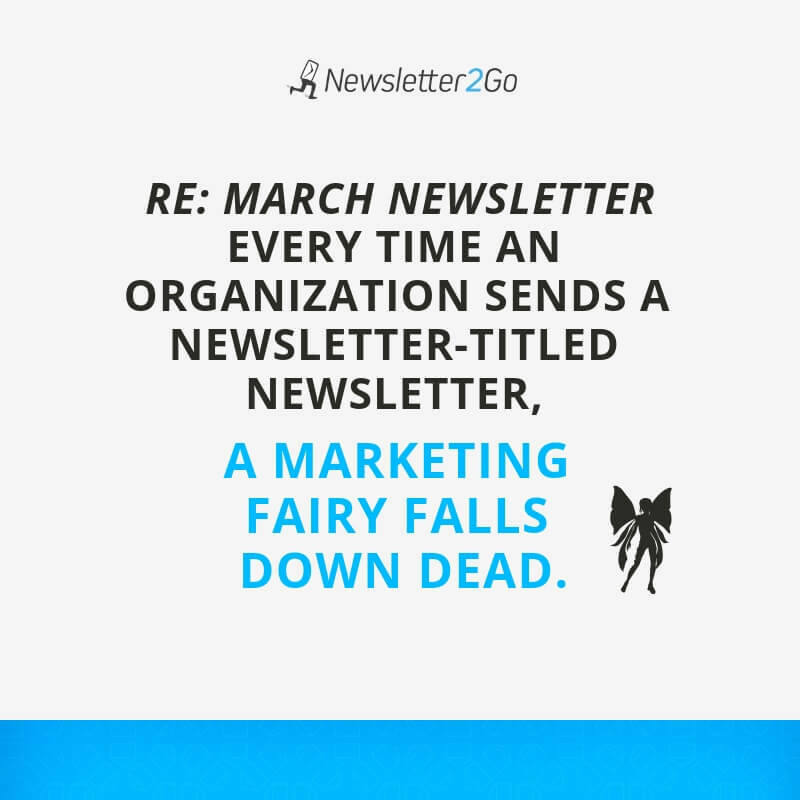 Every time an organization sends out a newsletter-titled newsletter, a marketing fairy falls down dead. That subject line is relying purely on reputation. We already established that your subject line is your second chance! If reputation won’t convince your followers to open your email, then your subject line and preview text are your last shot to do so. You’ve got to work harder than that. Even though your contacts might have signed up for your newsletter, that just means they’re giving you a shot at holding their attention. It means you’ve got to keep working at it to interest them. Bonus points if it’s a contentious question! Similarly, your preview text, which follows the subject line in many email clients, should be carefully thought out in exactly the same way. Subject lines are the classic field for A/B testing. If you A/B test one thing, let it be the approach you take to your subject line. Remember that there has to be a theory behind your A/B testing. So you shouldn’t just A/B test your two favorite subject lines, but rather, A/B test a subject line that uses urgency vs. a subject line that uses humor, and see which one performs better with your target group. Once you get repeatable results, you should have a proven method that you can keep using in the future. Make sure you give yourself time to check your newsletter before you send it out. ✔ First, preview it to make sure it’s exactly how you want it to look. 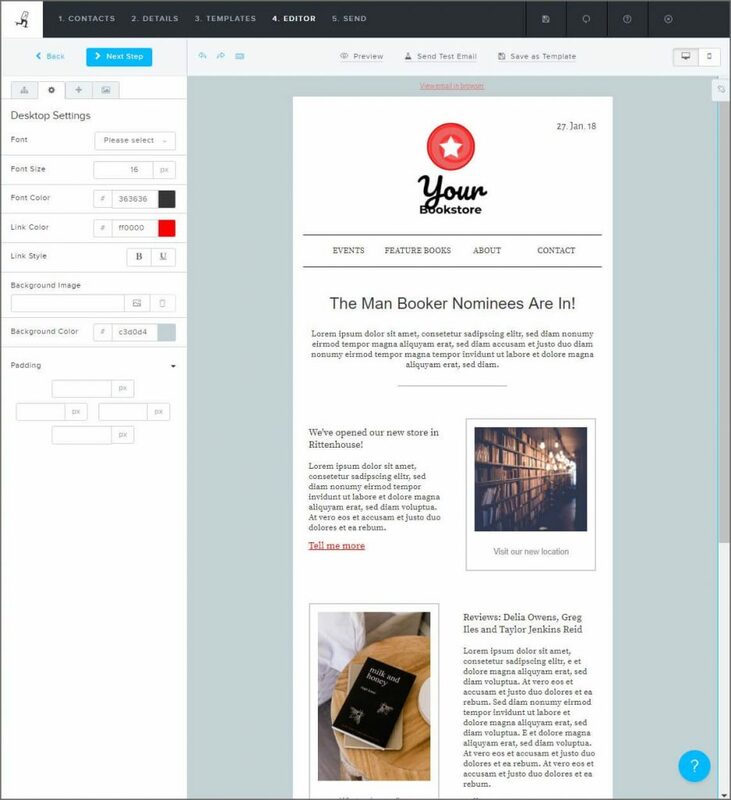 Your newsletter software should offer you multiple preview options: desktop and mobile. ✔ Next, send a test email to yourself and perhaps to someone else to proofread/check. Open that test email in a few different email clients, if possible, to see how the display changes. ✔ Finally make sure all those links work – either by manually checking each link or relying on your software’s built-in link checker tool. Before you hit send, Newsletter2Go will run multiple automatic checks for you. Our link test will make sure all links have been entered correctly, our spam test will look for patterns to avoid that might trigger a spam filter. ✔ Email clients will each display an email differently, which is why it’s good to run an email client display test before sending. This will show you exactly how your mailing will look in 36 email clients, such as Outlook and Gmail. Wait! You’re so close to sending out your first newsletter that you can taste it. You’ve followed all these steps and you’re itching to press send. Ask yourself if your recipients will be checking their email now. If so, go ahead and hit send. But if not, or if you’re not sure, then think again. If you’re working late into the evening, you might not want to send your email out. 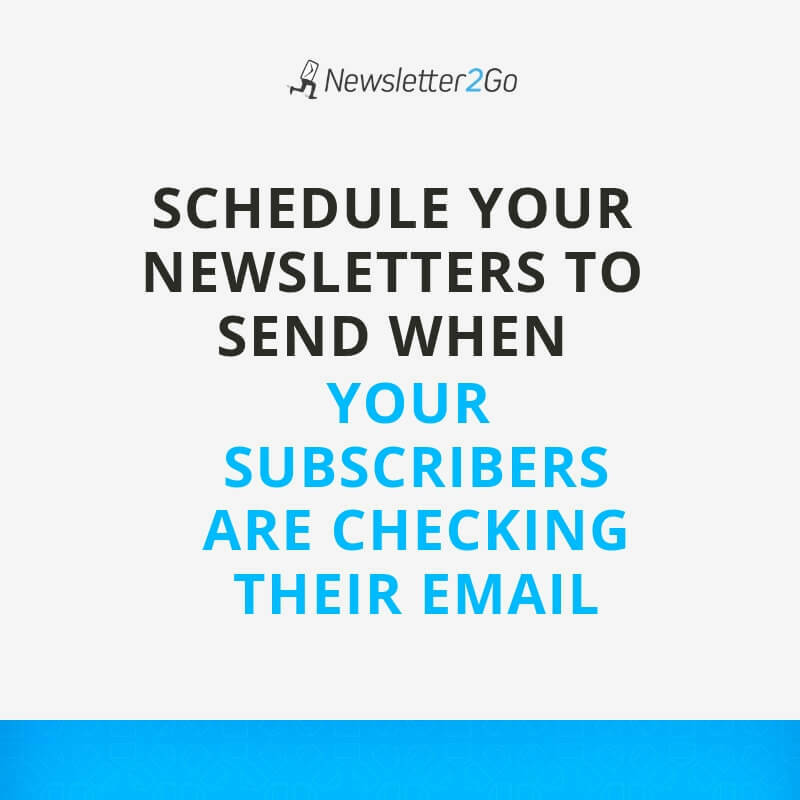 Better yet, choose a send time when you know your subscribers will be checking their email. There’s an art to figuring out the best time to send email newsletters, and it varies from target group to target group. Experiment with different send times until you find one that gives you the best open rates. Ready to Start Creating Newsletters with Newsletter2Go? Sign Up and Start Making Your Own Newsletters Today! How many people opened your newsletter? Of those who opened, how many clicked? How many subscribers converted (completed a purchase or donation)? You can find these and other email marketing KPIs in your email software’s reporting dashboard. But the reporting alone won’t help you improve – it’s what you do with it! Test various optimization tactics, one at a time. That’s the beauty of repeated email newsletters, every time you send, you have a chance to improve on what you did the last time. Now let’s talk about how to send customized newsletters. After all, this is one of the benefits of email marketing software over design software or mass mailings. Maybe even THE benefit that convinced you to choose an HTML newsletter software. All newsletter software should allow you to have some level of personalization in your emails. The good ones let you create personalized content blocks. This means that one single mailing will display different content to different recipients. This type of content is also called smart content. But before you decide what different content you will display, you should think about how you are going to group your recipients. For example, you may choose to address subscribers in different languages but keep all your reporting for that mailing in one place. Alternatley, you could vary your call-to-donate based on subscriber age. You may want to send contacts “local news” items, grouped by where they live, or for internal company newsletters, you may choose to group at least one news item by related departments. Remember that you can vary just one or two things – it doesn’t have to be the whole newsletter. Even just a single chunk of highly personalized content will make your audience feel seen. 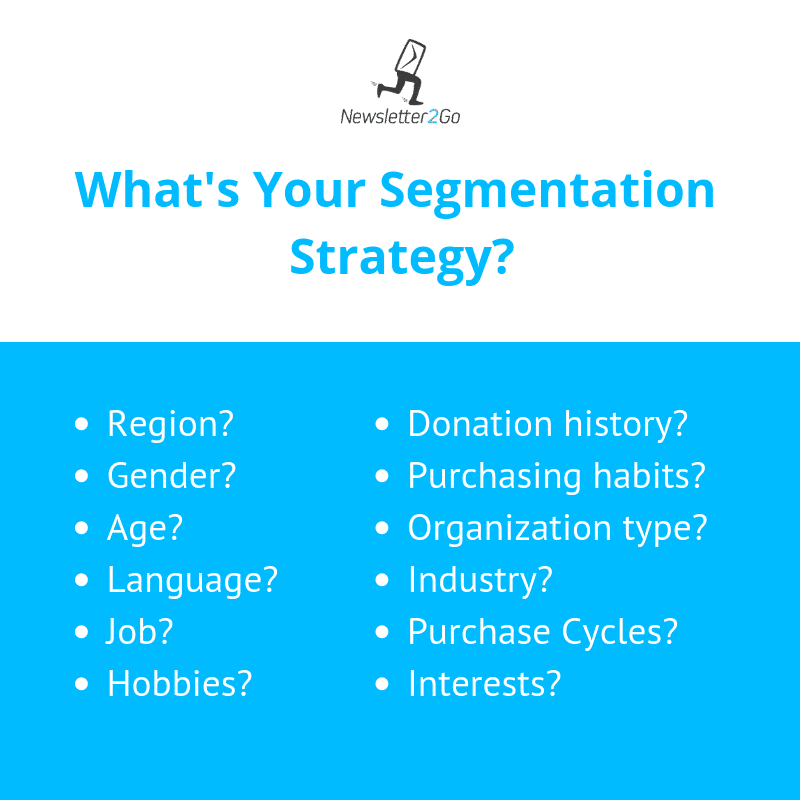 However you go about segmenting your email list, the most important part of this step is that you strategically differentiate between your subscribers. In our forms section, you can also create a contact profile asking subscribers to identify their interests. Use this form as a way to gather information about them that you use when creating segments. Need a Reminder of the 10 Steps + 2 Advanced Steps? Blog or Newsletter? Which Should I Do? People might tell you you don’t have time for blogging and sending newsletters. The truth is actually the opposite. If you’re blogging and not disseminating email links to those blogs, you’re wasting an opportunity to maximize your reach. It’s not a matter of blog vs. newsletter. It’s a question of making a blog and a newsletter work with as little time-cost to you as possible! Copying the metadata from your blog into your newsletter can seem like a lot of work. Our 1-click content transfer can help you with this! This feature will import data from your CMS (e.g., WordPress, Drupal) into your newsletter. No more copying and pasting blog title, description, image and author! How Do I Make a Monthly Newsletter? Your monthly “formula”: Why are you sending a newsletter and what content and image formats will you include? 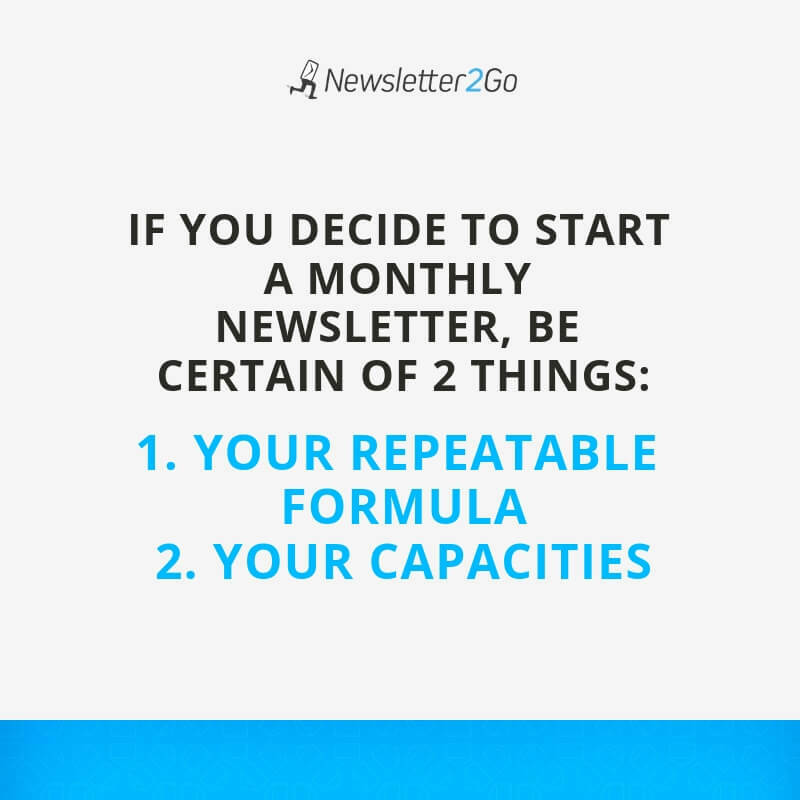 Your capacities: Announcing a monthly newsletter and then failing to deliver will make you forgettable. (Plus, you’ll feel bad!) Not sure you have that kind of sustained capacity? Start with a quarterly newsletter. How Do You Create a Successful Newsletter? A newsletter is successful if your subscribers want to read it. It’s that simple. And that complicated. Because subscribers and target groups vary drastically. A 17-year old punk getting an email from Hot Topic wants to read something completely different from a 65-year-old CEO getting updates on their investments. Know your audience and you’ll be successful. One of the best ways to get to know your audience is simply calling up a few customers and chatting with them. If you don’t have access to them, talk to your sales department. They can sure tell you a thing or two about your clients. How Do You Write a Good Newsletter? To write a good newsletter, write engaging content. What will your subscribers find funny? What will make them curious? What are their pain points? Whatever you do, don’t fall into the promotional trap. To avoid this, use the pronoun “you” way more often than “I” and “we.” A well-written newsletter adds value to the reader’s day. How Often Should I Send Newsletters? Send as often as subscribers want to hear from you. Regular sending is a good way to start. It establishes subscribers expectations. However, send too frequently and recipients will perceive you as a spammer. Send too little – recipients might forget about you completely. Unfortunately, no magic calculation exists that will give you the perfect sending rate for your specific target group. 💭 How much organizational capacity do you have to draft newslettters? Monthly? Quarterly? Weekly? Be honest with yourself about what’s doable. If you only have capacities for a quarterly newsletter, then start with that. It’s better to start off with newsletters that appear less often but still regularly. 💭 How often do your recipients want to hear from you? This can be a difficult thing to measure. After all, you can hardly call up every single recipient (you might not even have all their phone numbers!) and ask how often they want to receive your emails. Even if you could get them on the phone, they might not actually know the answer to that question. You can include an option on your newsletter sign-up form that asks subscribers how often they want to hear from you (weekly, monthly, quarterly). By attaching this to an attribute, you’ve saved yourself the guesswork around sending. You don’t have to send multiple mailings to your segments for frequency. 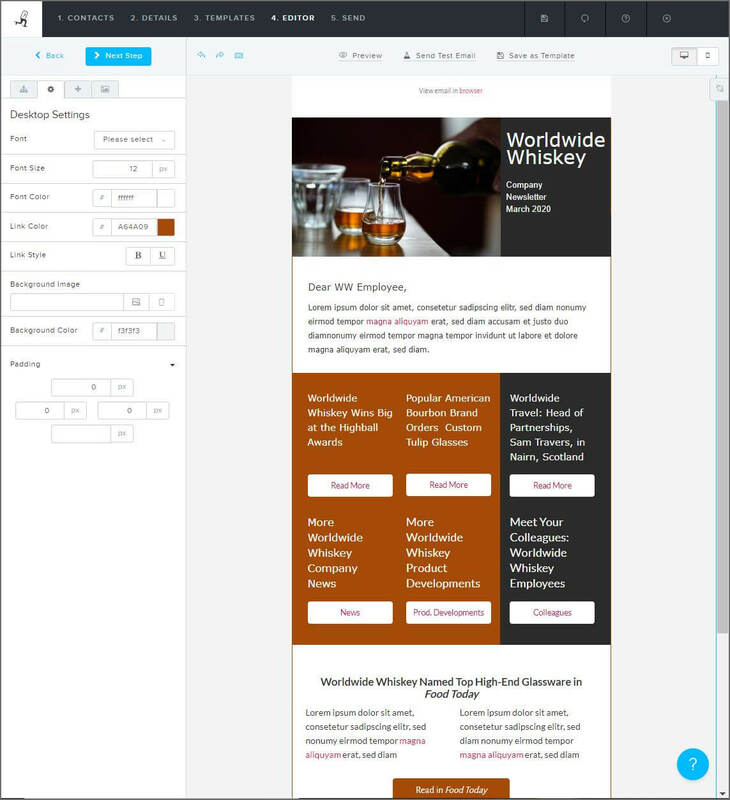 Instead, include design blocks personalized for the various groups in a single mailing. Test your sending frequency and observe your unsubscribe rate. If you can’t get your subscribers to self-segment, and you have a lot of subscribers, then it’s time to start testing. ✔ First, establish a regular sending frequency. Choose one you have the capacity to increase. For example, if the maximum you can send is daily, start by sending weekly. You’ll probably get some unsubscribes, but it shouldn’t be too many. An average unsubscribe rate, depending on your industry, is around 0.5%. 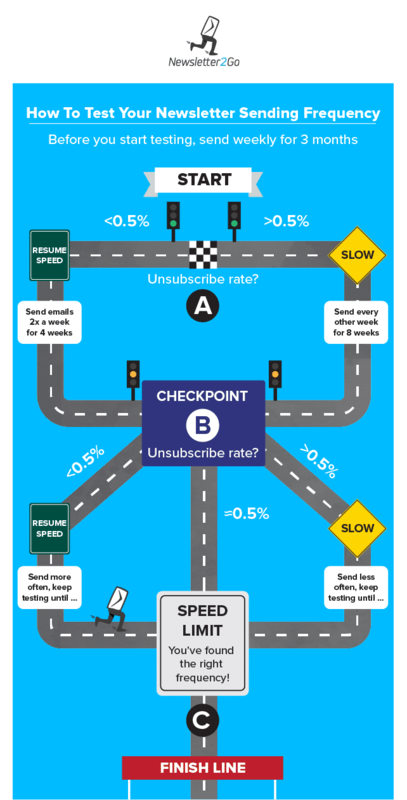 Unsubscribe rates will fluctuate at the beginning or if you haven’t been sending for a while. That’s normal. ✔ After 3 months of sending weekly, look at your unsubscribe rate and adjust. Unsubscribe rate > 0.5%? Send less frequently. Try every other week instead. Unsubscribe rate < 0.5%? Send more. Now it’s time to send emails twice a week. ✔ Wait another 4–8 weeks. Evaluate your unsubscribe rate again and adjust. What Is the Best Program to Create a Newsletter? Still not sure which newsletter software to choose? Read our tips on finding the best email marketing software for your business. How Do I Create a Newsletter Template? If you want to create a newsletter template completely on your own, you’ll need to know an HTML programmer. The good news is that there many other options out there! What Software Do I Need to Send Newsletters? To send email newsletters, all you need is one single email marketing tool. How Do I Get My Contacts Into My Newsletter Software? 💭 Import your data. Note, only do this if you already have permission to email your contacts. For example, you can do this if you are switching from another email marketing software to Newsletter2Go. In this case, you can upload lists via Excel, CSV or automatically sync them through one of our many plug-ins. Also, If you are residing in the EU or dealing with EU customers, note that cold emailing is illegal! If you are in the U.S., however, under CAN-SPAM it is legal to cold email contacts as long as you give them a simple way to unsubscribe. However, we never recommend it, as cold emailing will definitely hurt the overall performance of your email. And technically, it’s spamming. Some people joke that “CAN-SPAM” does exactly that – shows you how you CAN SPAM people. Resist the urge. Try permission marketing instead. There are many ways to incentivize a subscription so website visitors become subscribers. Check out our tips on how to grow your email list. How Much Does It Cost to Send Newsletters? Compared to other marketing channels, email marketing is one of the most inexpensive. 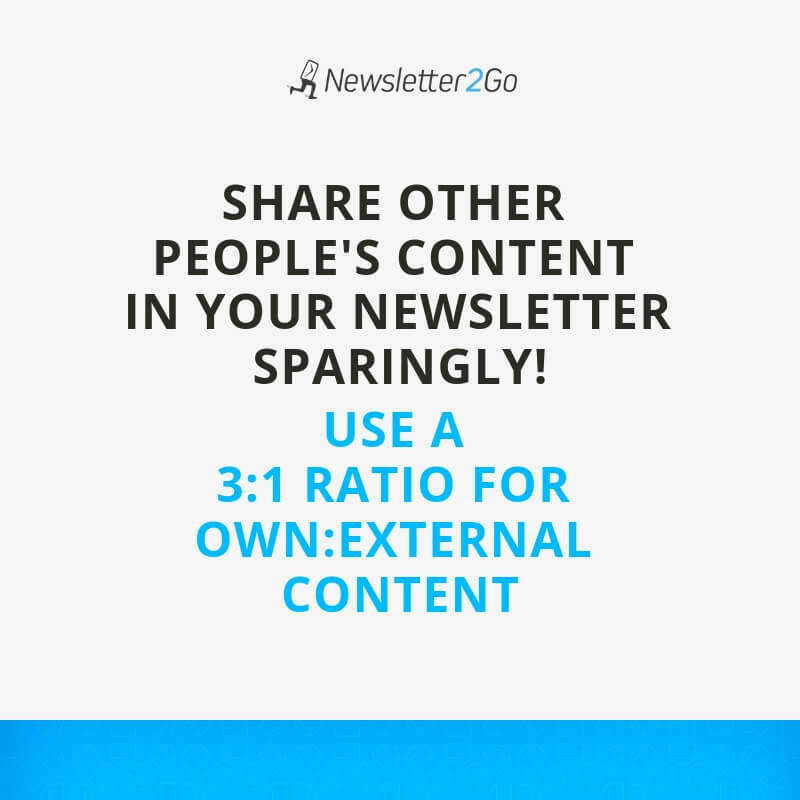 It costs between 0.0006 to 0.01 cents per recipient to send one email newsletter. Marketing experts have measured email ROI as being between 38:1 and 44:1. Now you know everything there is to know about creating newsletters. Are you ready for the next step? Create your Newsletter2Go account and start sharing newsletters with your community today! Try It Now – It's Free!